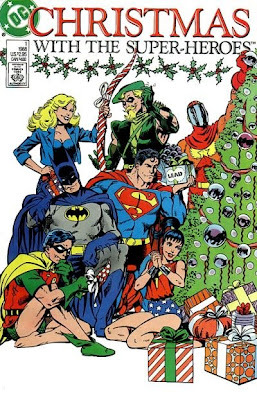 It’s that time of year again – tinsel and Christmas trees in the shops, Slade and Wizzard on the radio, festive adverts on the telly and over in the wacky world of comics, snow, Santa hats and bizarre guest stars galore! 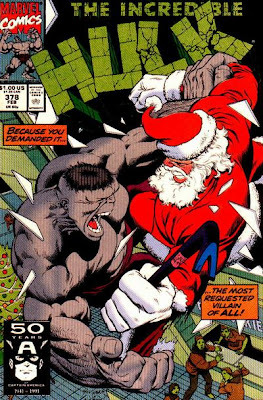 Comics have always celebrated the festive season, from the very early days of the original newspaper strips to the modern Marvel & DC Holiday Specials, and I’m quite happy to put my hand up and admit to enjoying them, no matter how tacky they may be! They might be absolute rubbish to read in July or August, but come December you just can’t beat unexpected snowstorms, Christmas trees, goodwill to all men and guest appearances from a mysterious man in red….. So here are some of my favourites from my 20 years of comic reading. Some I’ve picked because of a particularly enjoyable festive story contained within while some have been chosen purely on the strength of the cover. 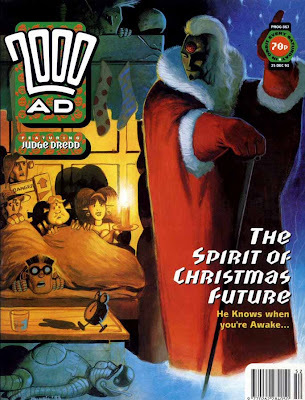 This has the honour of being the first American Christmas comic I ever read, following years of British comics - usually with snow on the logo (a practice I heartily endorse and wish the Americans would take up!) - and it’s a cracker, comprising reprints of Batman, Superman, Justice League, Teen Titans and Legion tales from years past. What could be more seasonal than watching Batman (God rest his soul!!) helping a reformed robber, dressed as Santa, to catch a group of criminals robbing a store on Christmas Eve, with assistance from the Christmas Star? 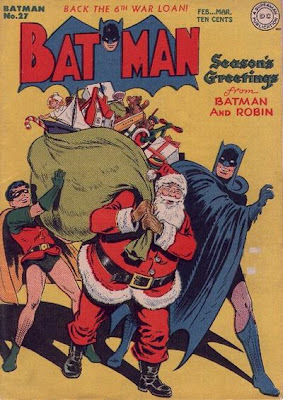 Well how about Batman singing Christmas carols with the Gotham PD while the spirit of Christmas uses Batman’s image and reputation to prevent crimes and spread goodwill! They genuinely don’t write stories like that anymore and DC proved it the following year by releasing a second issue filled with all-new stories that just weren’t quite up to the same standard, although Steve Rude’s Superman tale about a stranded motorist on Christmas Eve was quite nice. Chosen purely on the strength of the cover. 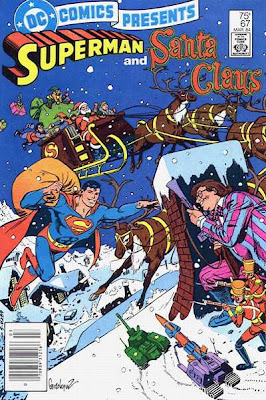 The actual story (about the Toyman delivering deadly toys to Metropolis kids and Superman being rescued by Santa at the North Pole) sadly doesn’t live up to the promise seen above. Superman helping Santa to finish his rounds on Christmas Eve - brilliant! And they even gave Santa his own logo - how cool is that?! A great cover and a great story. 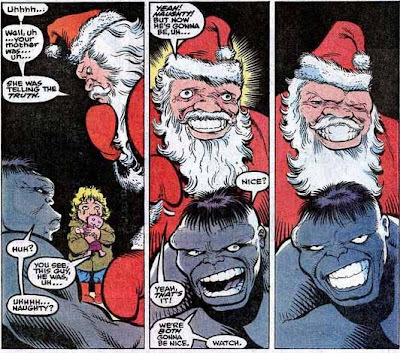 Peter David’s smart grey Hulk, during his time on the run with Rick Jones and Clay Quartermain, encounters the Rhino who, down on his luck and unable to remove his costume, has found work as a Santa. 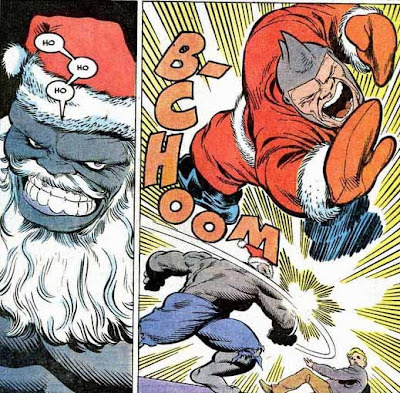 But just as Rhino is starting to feel the Christmas spirit he is recognised and the inevitable slugfest ensues. The brawling is brought to a sudden end when a little girl asks “Santa” why he is beating up the “poor gray man”. In a touch of typical David humour, Rhino and Hulk both try to convince the girl that Hulk had been naughty and was now going to be nice. It’s the kind of humour that was prevalent throughout David’s long Hulk run and has only just started to make a comeback in the Hulk replacement title Incredible Hercules. Joint position for No. 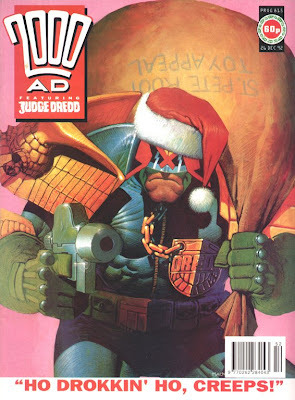 7 as I couldn’t choose from this pair of consecutive festive covers, one featuring Dredd and one featuring Tharg himself, both beautifully painted by Colin MacNeil. While #815 might just edge it for the best cover, #867 certainly has the best Christmas story with Dredd spending six pages in full Scrooge mode: binning Christmas cards, shooting perps and deporting illegal immigrants on Christmas Eve. All culminating with him punching out a drunk citizen who tries to kiss him! 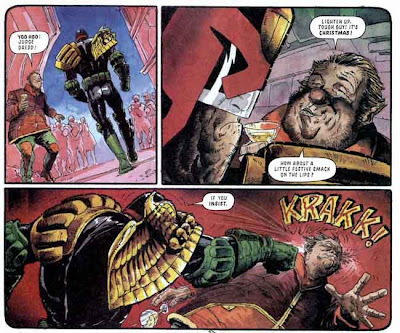 Classic Dredd. 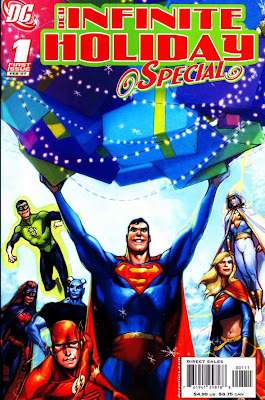 Another choice based purely on the cover and the earliest festive Superman cover I’ve seen. 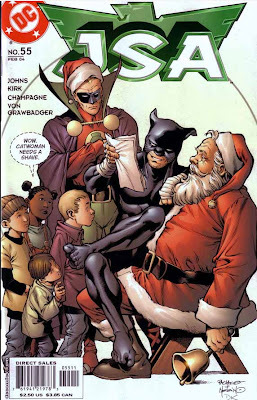 Interestingly, for a comic that was produced by a very Jewish creative team and publisher, the cover refers to Christmas and not “holidays” which became prevalent in comics from at least the 1950s onwards. 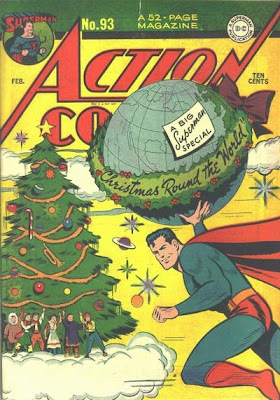 Quite why that bunch of kids are stuck on a cloud with a Christmas tree I don’t know, and I’m not sure how a big globe with a holly garland is going to help either…. 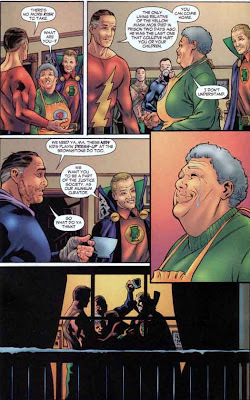 A lovely, sentimental seasonal tale here as Geoff Johns re-introduces the original Red Tornado to the DC Universe. 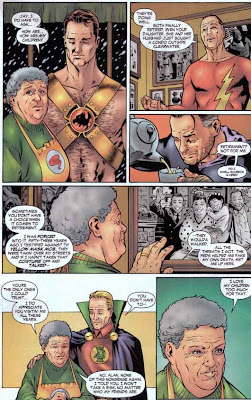 Ma Hunkel was the Red Tornado in the 1940s and, as it turns out, had not died but instead retired and gone into hiding to protect her family after testifying against a particularly vindictive crime gang. The only people who knew she was still alive were Wildcat, Hawkman and the original Green Lantern & Flash. They made a point of visiting her every Christmas Eve but on this particular Christmas Eve they have a surprise for her. The last known associate of the criminals has died and Ma can finally come out of hiding… Merry Xmas Ma Hunkel! 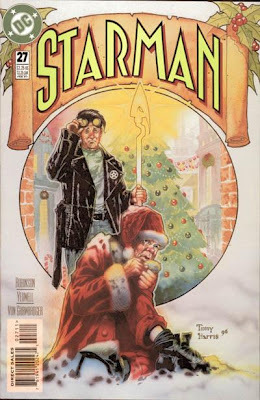 I had to get Starman in here somewhere and what better than #27 – a fantastic cover by Tony Harris with Jack looking rather puzzled at a sad Santa and a fantastic story in which Jack helps said Santa. In fact this Santa isn’t just sad, he’s outright miserable! A homeless war vet who has lost his family he didn’t think he could get any lower and was actually trying to turn his life around by working as Santa in a department store (American stores will obviously employ anyone as Santa regardless of status or criminality! See Nos.10 & 7 above!) when his locket containing the last picture of his family was stolen. Jack, being Jack, helps him to get it back and Starman, being Starman, means there’s obviously a supervillain involved. The issue ends with the poor homeless guy being invited along to the O’Dare’s Christmas dinner with all Jack’s family and friends. Presumably he’s back out on his arse come Boxing Day (no-one wants a tramp stinking up the house all over Christmas) but it’s a nice finish to a lovely festive tale. One of my favourite Christmas comics of all time. No continuity, no gimmicks, just a great Superman story that could easily be read by anyone. 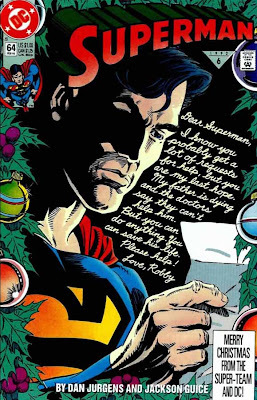 Basically, over the course of one Christmas Eve in Metropolis, Superman performs good deeds inspired by letters sent to him over the preceding year. He reunites two sisters who were separated by the Holocaust and haven’t seen each other since, tries to explain to a little boy why he couldn’t save his dad from a fatal brain tumour, and helps a dying woman to get a heart transplant. 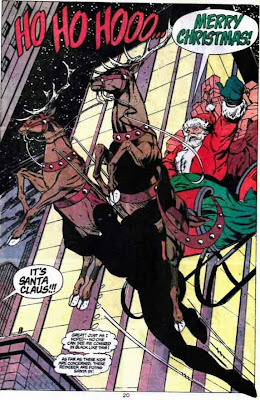 Then, to top it all, he gets Bruce Wayne and Professor Hamilton to help him knock together a sleigh full of presents for a group of orphans which he then flies in, incognito, so they think it really is Santa! And it that doesn’t get you feeling all Christmassy I don’t know what will! Although how those reindeer felt about being flown about is anyone’s guess! I’d just put the finishing touches to this article when I found this little gem online and I had to share it with you. 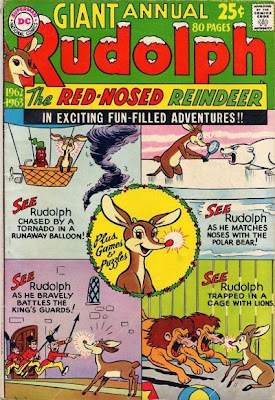 As impressed as I was by DC giving Santa his own logo, I was even more surprised to find out that they published a Rudolph The Red Nosed Reindeer title every Christmas for 12 years! This annual is actually a collection of stories from pervious years and was, sadly, the final issue – just imagine what it could have been like if it was still published in the more socially-aware 70s, or the grim and gritty 80s? On the other hand just imagine what Grant Morrison or Alan Moore could do with the title….. So there you have it. Ten comics guaranteed to make you laugh or smile or cry or just feel generally more Christmassy and festive than you did. Merry Christmas, Paradox Blog readers, and feel free to make your own seasonal suggestions below. Christmas - a time for giving gifts, spending time with family and.... federal grants?! 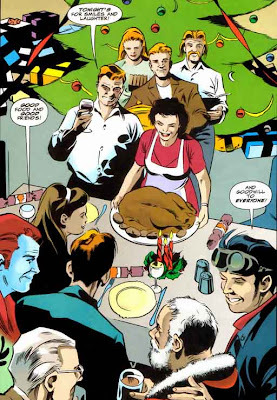 Anyway, Spider-Man: Tangled Web #21 gets my vote for a great Christmas comic due to the the midas touch of Darwyn Cooke. Would love to see more Spidey stories from him at some point in the future. 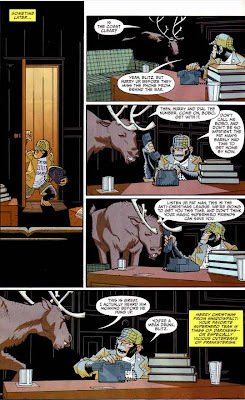 No mention of the superb (Christmas) issue 19 of Shade the Changing Man? Shame on you! :) Am I the only person who read (and rates highly) that series?